Nichiren decided. It is time to stand up. There is the person who knows the method of riding out a national crisis called the foreign invasion. There is nobody but oneself for it in Japan. The prime cause of the Mongolia invasion is that the Kamakura Shogunate laid a wicked religion as religion of nation protection and gave the wicked religion group a large amount of offering. The personal letter was sent from Mongolia. This is the rare opportunity now he should warn the nation again to let Tokimune Hojo believe in the Lotus Sutra and stop the offering to a wicked religion. And the method to exterminate wicked doctrine gathers the Buddhist priests of each sect in front of a king and has no choice but to do "confrontation at a public place" of selecting the right or wrong. Great Teacher Tientai and Great Teacher Dengyo do Kosen-ruhu of the Lotus Sutra by the victory of this confrontation and are opening the peaceful times. Great Teacher Tientai preached so as "the Lotus Sutra was shakubuku and would break the temporary teachings" in 9th of 'the Profound Teachings of the Lotus Sutra'. Nichiren either followed this equation. Nichiren often mentions ‘the confrontation at a public place' to writings as follows. “The place where we decide right or wrong between the world or Buddha's world; it must be performed in a public place emphatically”. 'Letter of reply to Gonin'. “Cannot express the pitch of the ability if do not discuss; cannot measure wisdom and folly if do not have a showdown”. ‘The written imperial order, command from a noble and petition of Enryakuji Temple to expel the Nembutsu bonze’. The right or wrong of things are decided by discussion one-on-one. This difference stands out still more if we perform this in public attention and becomes the profit to a person to hear with a beholder. The democracy of modern times embodies this spirit. In other words, Nichiren was pursuing democracy in the Kamakura era of the thirteenth century. The settlement by power does not last long. It is a self-evident truth that a debate of the superior human wisdom draws a superior conclusion. Nichiren was going to offer battle with various sects by the Lotus Sutra which preached "only Buddha and Buddha knew the Law of all the universe exhaustively". ‘The Expedient Means in the second chapter of Lotus Sutra’. At first, he wrote a letter to a person called Hogan who had power inside the Shogunate in April, and asked him for adjustment. 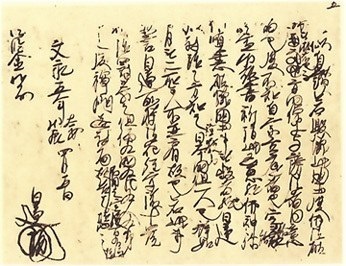 “When I observed the great earthquake, and the great typhoon and famine that occurred in the Shoka era, as well as the major outbreak of pestilence that took place in the first year of the Shogen era, I, Nichiren, made a prediction, saying, 'These are omens indicating that this country will be destroyed by a foreign nation'. I may seem to be praising myself for having made such a prediction, but if our country should be destroyed, it would most certainly mean the destruction of the Buddha's Law as well. However, the eminent Buddhist priests of our times seem to be of one mind with those who slander the Law. In fact, they do not even understand the true meaning of the teachings of their own sects. It is certain that, if they should receive an imperial command or instructions from the government authorities to offer prayers of eliminating the evils that beset the nation, they would only make Buddha and deities angrier more, and then the nation cannot help but face ruin. I, Nichiren, know the method that should be taken to break this deadlock. Other than the sage of Mount Hiei, I am the only person in Japan. For example, nobody can compare with saint, there are not two sun and moon. If these words of mine are false, will I be punished by the ten daughters of demon who protect the Lotus Sutra that Nichiren keeps. I am saying this opinion solely for the sake of the nation, for the sake of the Law, for the sake of persons, not for my own sake. I inform you of this for meeting you in person. If you did not adopt this, you will surely regret it later. The fifth day of April in the fifth year of Bun'ei (1268).